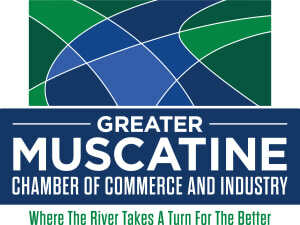 Membership in the Greater Muscatine Chamber of Commerce & Industry (GMCCI) is an investment in your business, the Muscatine area and its future. Every company, organization and person has a vested interest in the growth and sustainability of our economy. Maintaining a high quality of life is a motivation to residents who call Muscatine their home. GMCCI is constantly working to strengthen the economic foundation and community structure. We host a variety of events that build community, while aiding actions to expand business. No area of business and community development is left behind. Your membership investment allows our efforts to continue and your active involvement enables community visions to become reality. GMCCI offers a broad spectrum of benefits and services to its diverse membership base. Take a few minutes to see how GMCCI may help you meet your needs. GMCCI can put you in touch with hundreds of people who could become new clients, customers or patients. Below is a brief listing of some networking events that are available to members of the Chamber at no additional charge. Business After Hours – popular membership networking events where members can meet, exchange business cards, greet friends and talk business in a relaxed and informal setting with food and drink. Business After Hours is held from 5 to 7 p.m. on the second Thursday of each month at a member host location. This allows the host to showcase their business. Committees – participation in committee activities and working with others on major projects offers members additional opportunities to meet business and professional people with similar interests, goals and concerns. Special events – such as GMCCI’s Annual Meeting Recognition Night, held the last week of March brings members together for an evening of business and pleasure. There is no better way to get your name out before the public and the business community than through a GMCCI membership. Membership listings – all members can receive an alphabetical listing of the Chamber membership on an annual basis at no cost. All members are listed on our website in an alphabetical and categorical fashion. Opportunities to purchase additional advertisements on the website can be obtained by contacting GMCCI. Promotional literature distribution – members are welcome to display brochures or other materials in the GMCCI Information Center at no cost, giving your firm exposure to thousands of residents and visitors who browse through our information center year-round. Relocations packets are also available at no cost. Direct mail promotion – mailing labels for GMCCI’s membership is available for purchase and use, which can give you direct access to a prime audience of business prospects. Advertising opportunities – are available to members first in our city/county maps, visitors guide and other publications and events. Referrals – GMCCI receives thousands of requests each year for recommendations on goods or services to be purchased in the Muscatine area. We refer GMCCI members first to newcomers, visitors and our residents. of our fiscal year, and is distributed at the Annual Meeting. If you are in need of meeting space, you might consider one of GMCCI’s two conference rooms. The use of the conference rooms is free to members and scheduling is done through the GMCCI office.